You bought the the window display dummy, now you need a hairpiece. 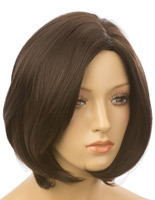 These wigs for mannequins offer competitive prices with the styling you'd expect for merchandising your clothes lines. We stock false hair in both male and female versions made from Kanekalon fiber. 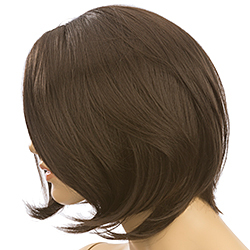 This synthetic fiber has been around for over 50 years as a substitute for real hair. 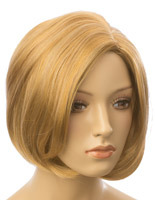 The wigs for mannequins feature soft and natural-feeling hair with excellent body. Each style remains set with non-fading color! 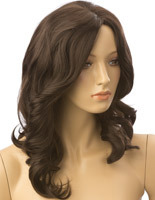 Best suited on our line of realistic display figures, our wigs for mannequins are very affordable and even better, easy to care for. What are some of the advantages of false hair over real hair? 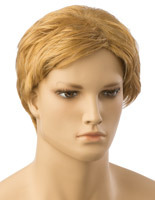 These wigs for mannequins, made with Kanekalen fibers, cost a lot less than the real variety. They are the more popular of the two due their ease of care and handling. The synthetic models also come in many more styles and color choices. Short types can be simply shaken out, while longer hair pieces might need a combing or finger-styling. More importantly, they hold up to humidity without losing their shape. Their real hair counterparts simply need much more care and don't take kindly to shifts in the weather. 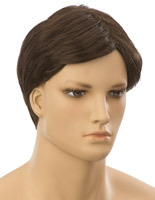 Due to their application, it makes sense to use synthetic hair pieces for your mannequin displays. They are designed to be (relatively) maintenance free, which means your employees save valuable time better spent dressing the figure and less time fussing with their hair. We stock synthetic hair in a few varieties for female figures. They come in blonde and dark brown in both short bob and long curly styles. Male versions offer short cuts in the two colors as well. All products are non-flammable for safety. Outfit your dress figures with realistic hair for creating the best appearance for your clothing lines!